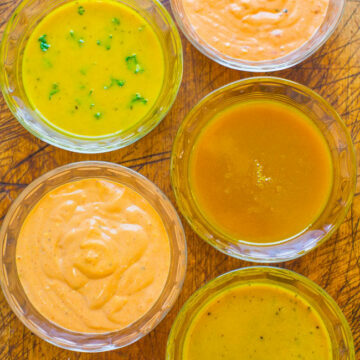 5 Easy Mustard Sauces, Dips, and Marinades – EASY recipes for everything from salad dressings to chicken marinades!! 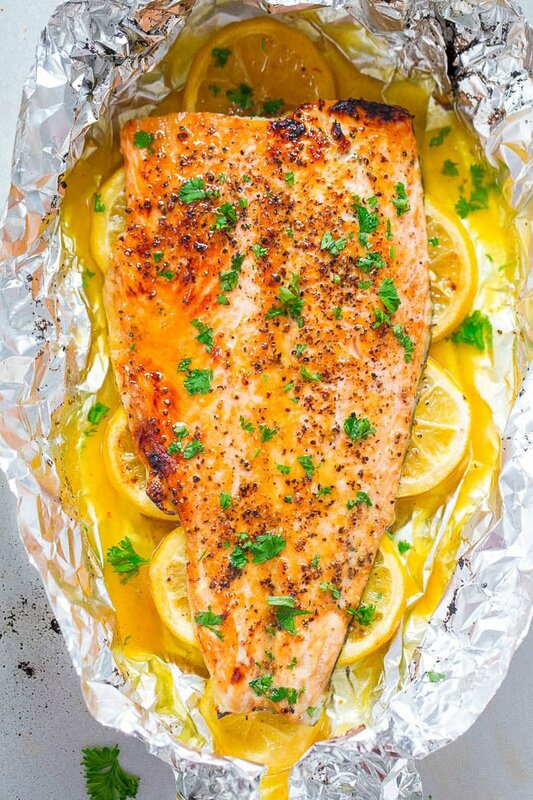 Mustard is so VERSATILE and the star of the show in these FAST recipes that will transform the FLAVOR in your favorite dishes!! I am one of those people that loves sauces and dips. In a restaurant I need to order extra (and then extra again) of whatever sauce or dip comes with my order since I like a little food with my sauce. 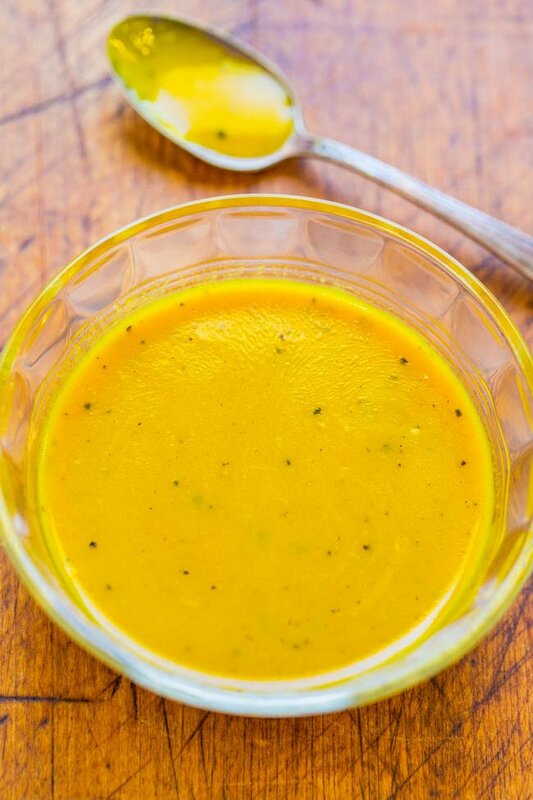 Mustard is one of my favorite ingredients because it’s so versatile and I love the tangy taste. 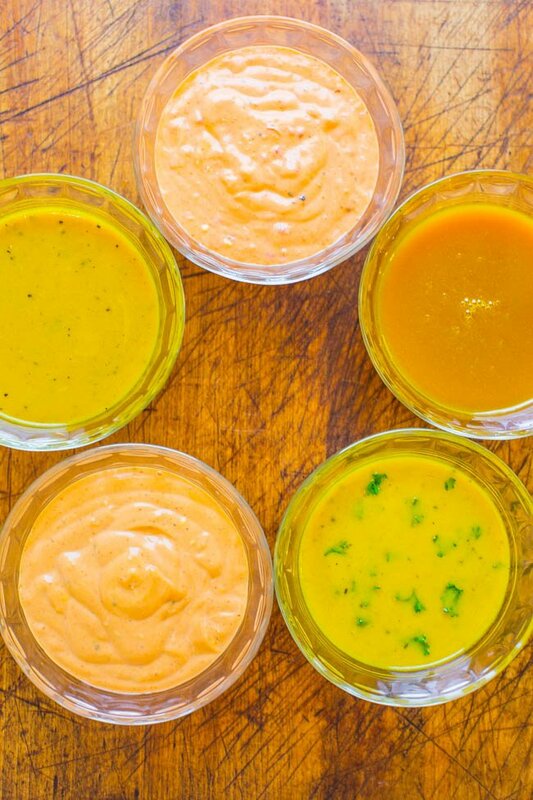 It can be used to make simple glazes, marinades, dressings, or dipping sauces that are perfect for quick and easy weeknight dinners or your next summer gathering. 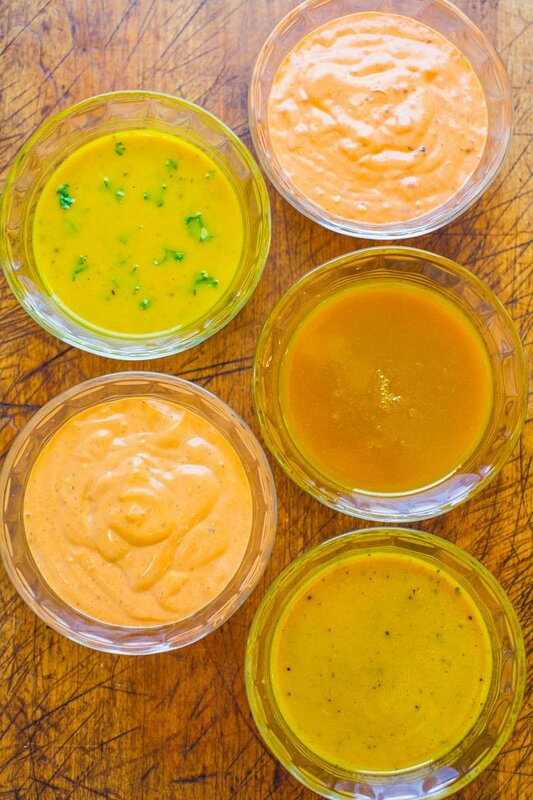 Below are five of my favorite mustard-based sauces, dips, marinades, and vinaigrettes. Each is as simple as combining a few ingredients and whisking until smooth and they literally take 30 seconds to whip up. My kind of recipes. Each one can be used for multiple purposes whether it’s for dipping French fries into, smearing on a bun before you top it with a juicy burger, or as a marinade for grilled chicken, or as a cooking sauce for fish, you can definitely get creative with how you use each of them. Don’t be afraid to add individual ingredients, to taste, in each of the various recipes. If you have a sweet tooth, add a little more honey. If you like heat and spice, don’t be shy with the sriracha. Each recipe makes approximately 1/2 cup sauce but you can easily double, triple, etc. if you need more. Post is brought to you by French’s. The recipes, images, text, and opinions expressed are my own. 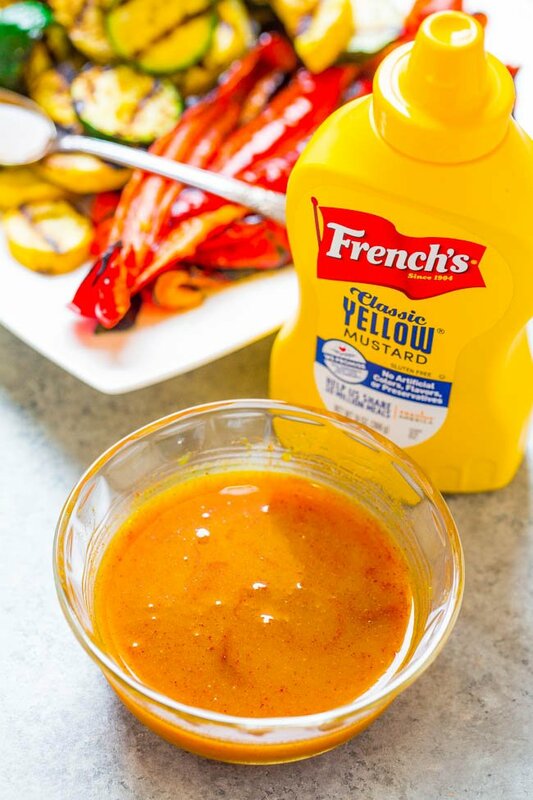 This fun sauce gets it’s smokiness from a smoked paprika and Zatarain’s Creole Seasoning that’s mixed into French’s Classic Yellow Mustard and honey. This easy smoky mustard can be used as a dip for grilled veggies. Grilling the veggies adds wonderful smoky flavor to them and when you dip them into the smoky mustard, it really plays up the smoky flavor profile going on. 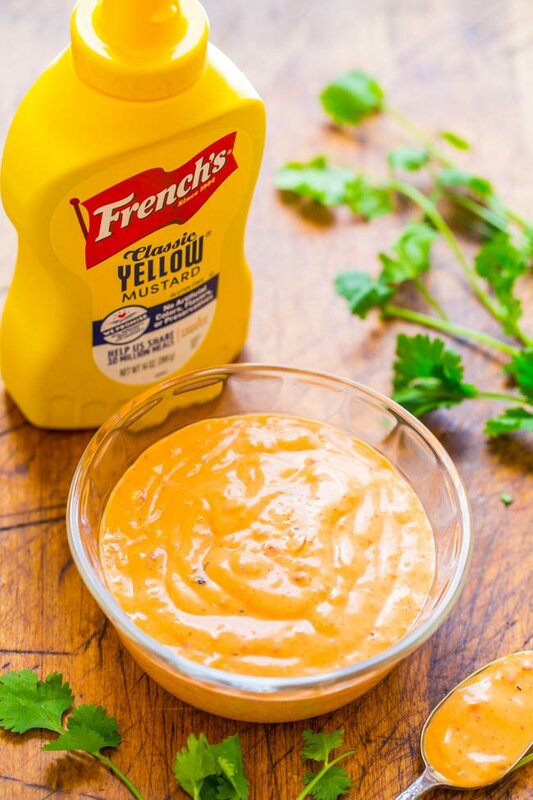 French’s Classic Yellow Mustard is made with stone ground, #1 grade mustard seeds. No artificial flavors. No colors from artificial sources. Or use it as a sauce on grilled chicken kabobs, as a salad dressing, or as marinade or cooking sauce for chicken, salmon, or turkey. There are different ways of making this creamy sauce but I make it by combing mayo, ketchup, French’s Classic Yellow Mustard, lemon juice, Worcestershire sauce, chili sauce (sriracha), garlic and onion powders, salt, and pepper. I just adore dipping waffle fries and potato chips into it or if you want a dip to jazz up raw veggies like carrots, celery, or bell peppers, this is perfect. If you like things a little hotter, add more chili sauce which is exactly what I did and this packs a pretty serious punch – but you don’t have to be as heavy-handed as I was. This is such a versatile one and it’s great as a light vinaigrette on salads or as a marinade or finishing sauce for chicken or fish. 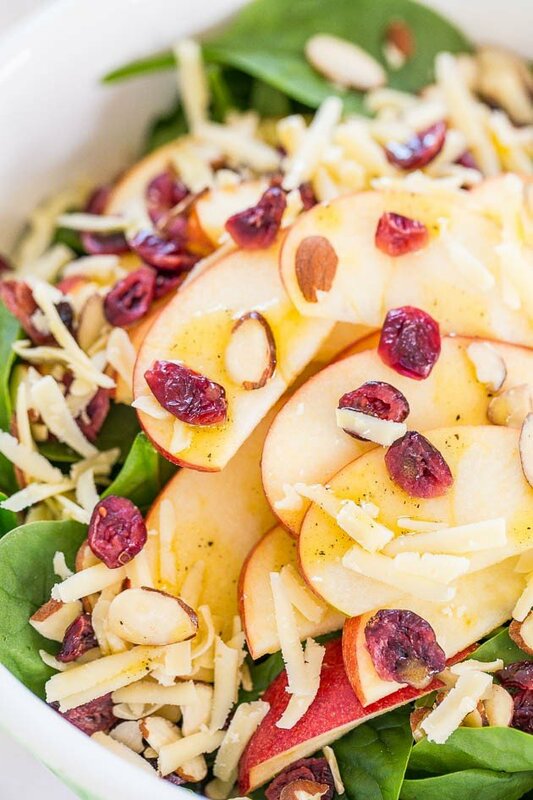 It’s not heavy and doesn’t weigh anything down which is nice when you’re trying to enjoy the natural freshness of a salad or veggies or don’t want to drown out the more delicate flavors in a lighter-tasting fish like tilapia. 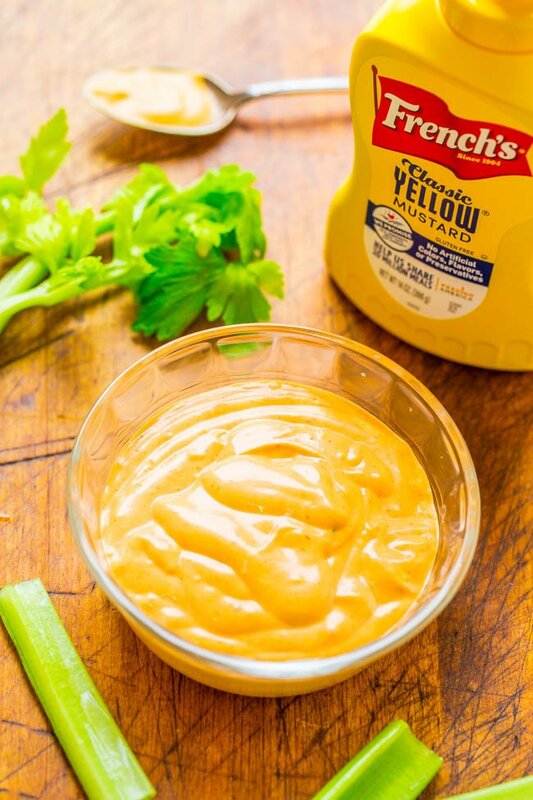 Just whisk together French’s Classic Yellow Mustard, vinegar, olive oil, fresh parsley (or substitute with green onions, chives, basil, cilantro, dill, etc. ), salt, pepper, and a pinch of sugar if you’d like. 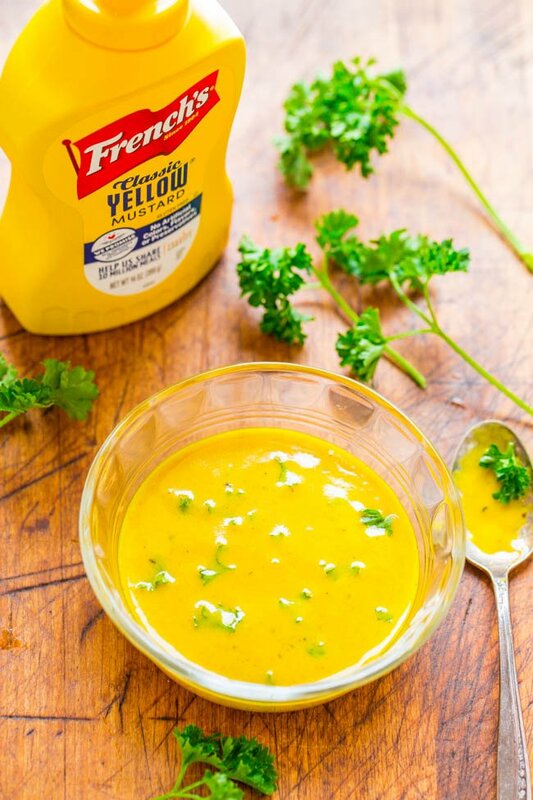 French’s Classic Yellow Mustard has zero fat, calories, or gluten. Spice and garlic fans, this one has your name all over it. It’s nice for dipping everything from pretzels to fries into, spread it on burgers as a kicked up sauce rather than just ketchup, or use it as a marinade for grilled chicken when you’re in the mood for something with a kick. 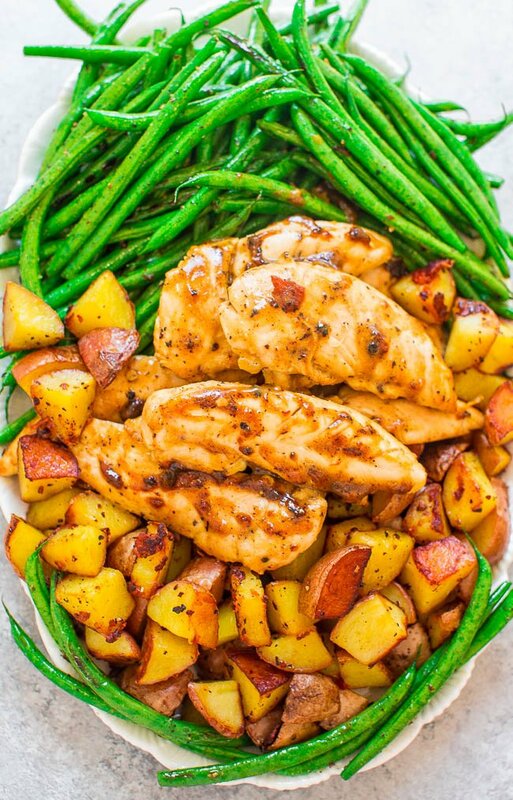 It helps keep the chicken so tender, juicy, and delivers so much flavor. It’s so easy to whisk together in just a minute. Another added bonus is that my chicken did not stick to the grill at all with this marinade. It was like no-stick magic going on. 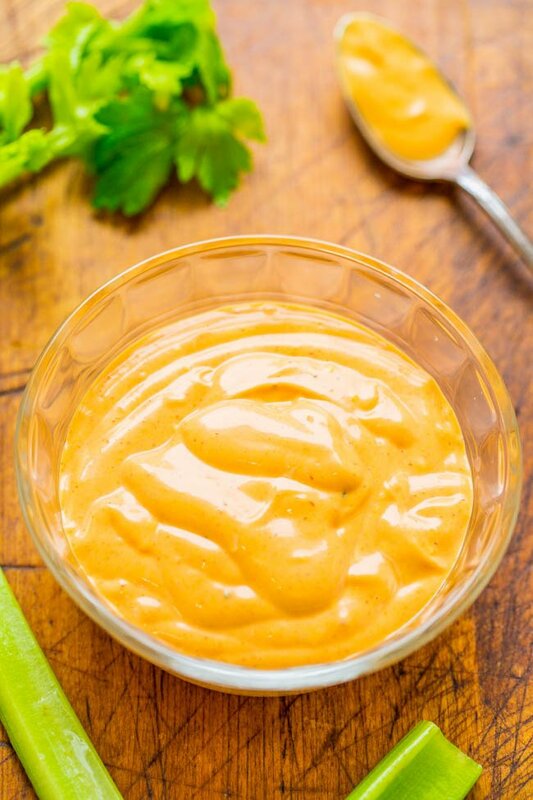 Combine mayo, French’s Classic Yellow Mustard, lime juice, garlic, chili garlic sauce, sriracha, honey, salt, and pepper. Add cilantro if you want to play up a Mexican vibe or if you have fresh parsley on hand, it’s a nice touch too. It packs a nice punch of heat thanks to both the chili garlic sauce and sriracha. If you’re sensitive to spices and heat, you may wish to start with the half the recommended amount of those two ingredients, and add more to taste if desired. This one is perfect to be used as a lighter salad dressing or as a lighter marinade for chicken or fish. Or brush it on chicken, salmon, or shrimp skewers as a glaze in the final moments of cooking. Whisk together olive oil, honey, apple cider vinegar, French’s Classic Yellow Mustard, salt, and pepper. 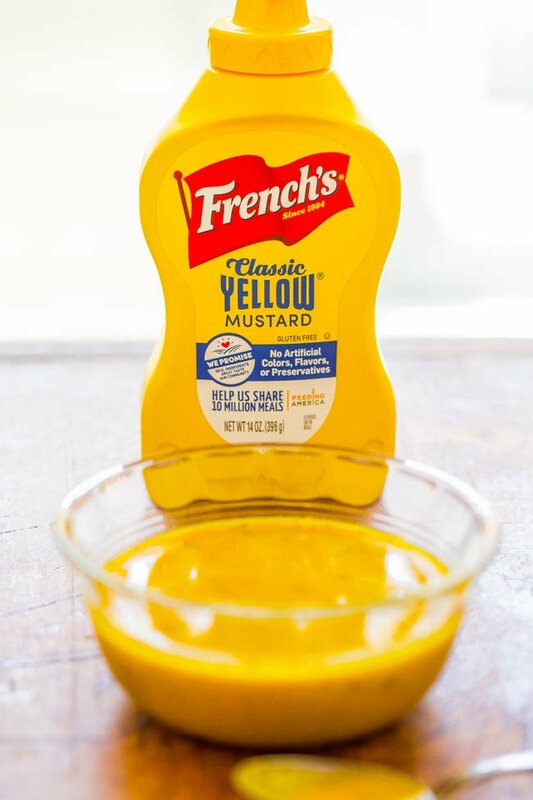 Vinegar gives plenty of tang, honey adds sweetness, and French’s Classic Yellow Mustard delivers the smooth texture and tangy taste your family will love in this well-balanced sweet and sour mustard. 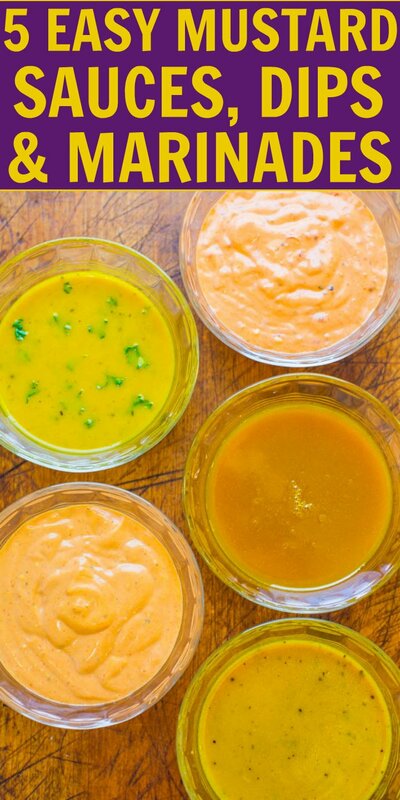 Smoky Mustard Dipping Sauce – Combine all ingredients in a small bowl, whisk to combine, taste, and make any necessary flavor adjustments. 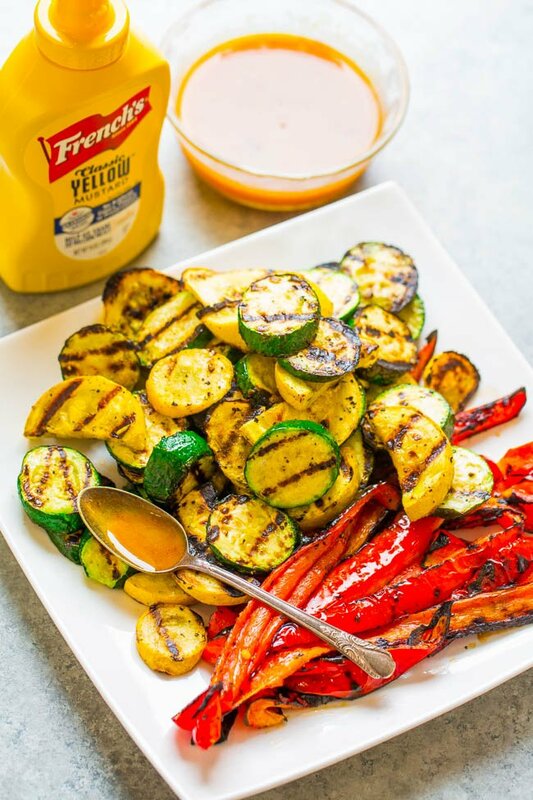 To make the grilled vegetables that are shown, slice 1 or 2 medium/large zucchini, 1 extra-large yellow summer squash, and 1 extra-large red bell pepper into bite-sized pieces or strips, toss them with 2 tablespoons olive oil, 1 teaspoon salt, and 1 teaspoon pepper. Grill the vegetables over medium-high heat for about 7 minutes, or until as done as desired; flip intermittently to ensure even cooking and serve with Smoky Mustard Dipping Sauce. Comeback Sauce – Combine all ingredients in a small bowl, whisk to combine, taste, and make any necessary flavor adjustments. Note – I used 1 1/2 tablespoons and this has a very good kick; start slowly with the chili sauce if you’re sensitive to heat and spices. 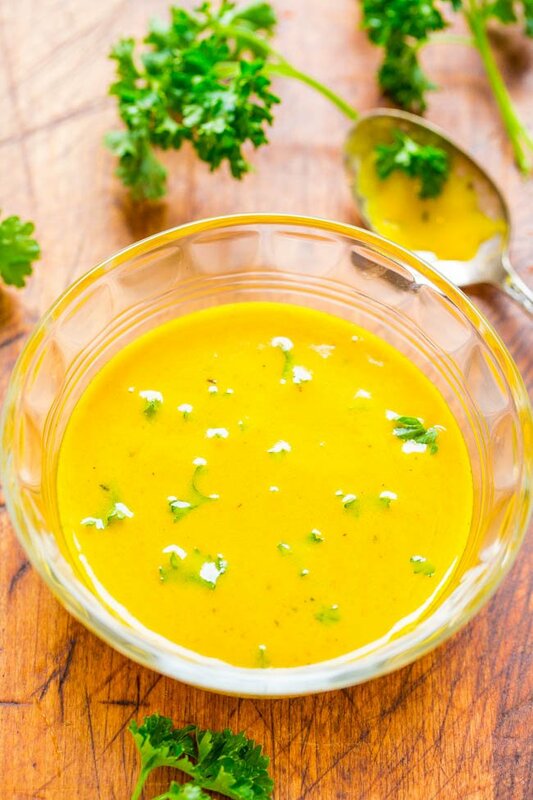 Herbed Mustard Vinaigrette – Combine all ingredients in a small bowl, whisk to combine, taste, and make any necessary flavor adjustments. 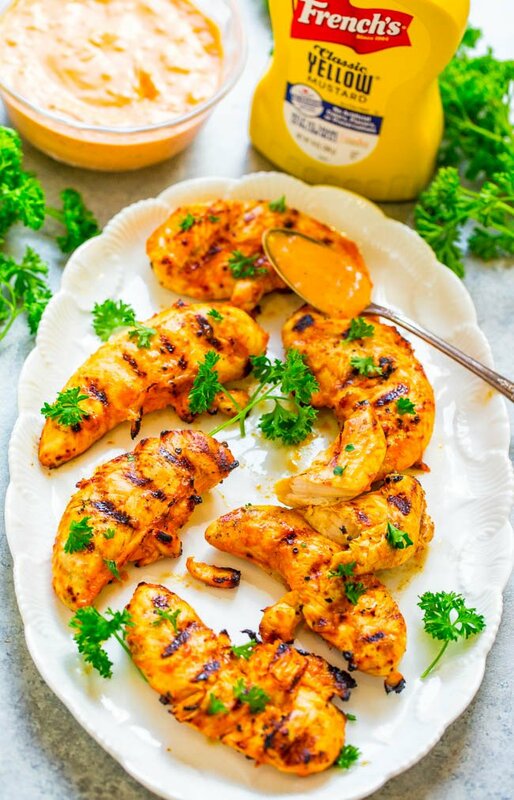 Spicy Garlic Mustard Marinade – Combine all ingredients in a small bowl, whisk to combine, taste, and make any necessary flavor adjustments. Note – if you are sensitive to heat and spices, you may wish to initially halve the amounts of chili garlic sauce and sriracha, taste, and work up from there if desired. 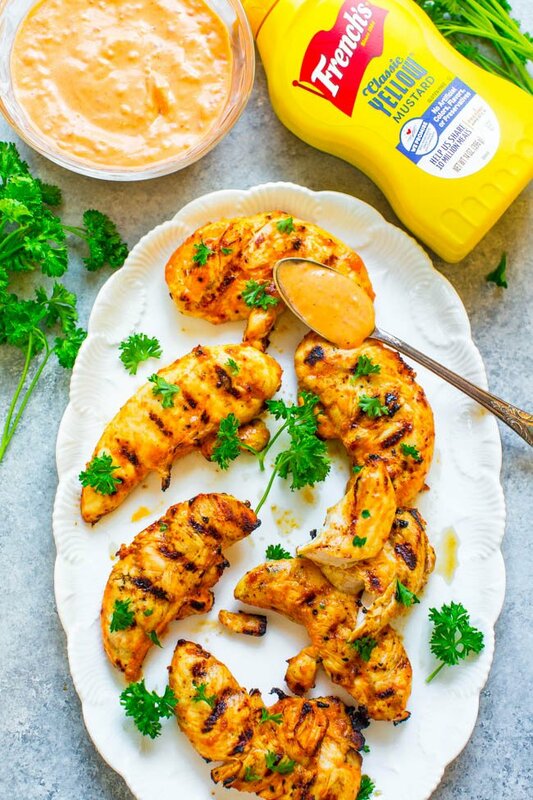 To make the grilled chicken that is shown, add 1 to 1.25 pounds boneless skinless chicken breast tenders to a large ziptop plastic bag, add the Spicy Garlic Mustard Marinade, 2 tablespoons olive oil, seal the bag, squish contents around to distribute the marinade evenly, and place bag in the refrigerator to marinate for at least 30 minutes, or up to 24 hours. Grill the chicken over medium-high heat for about 7 minutes, or until done; flip intermittently to ensure even cooking and serve with additional Spicy Garlic Mustard if desired. 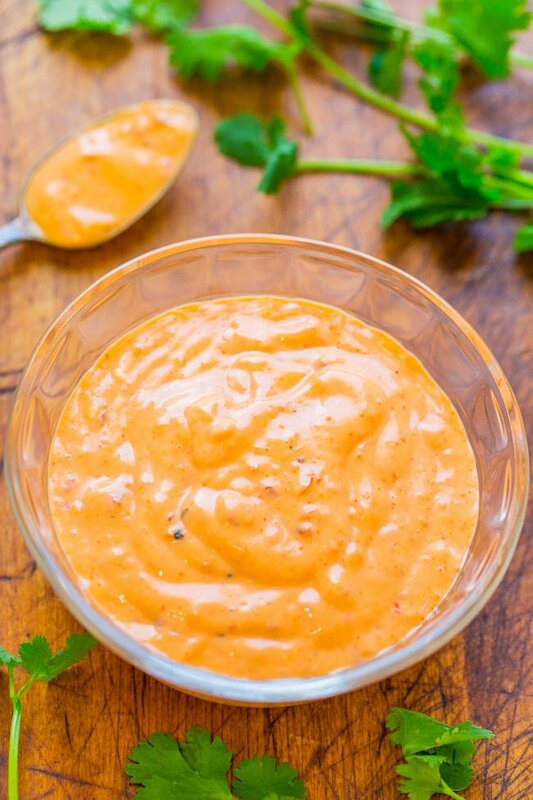 Sweet and Sour Mustard Dressing– Combine all ingredients in a small bowl whisk to combine (or add to a small mason jar with a lid, seal, and shake vigorously), taste, and make any necessary flavor adjustments. Each of the 5 sauces will keep airtight in the fridge for at least 1 week. These all sound so good I don’t know where to start! I have some cucumber and roasted beets that I would like to use today so I think I’ll chop those up, add goat cheese and go with the herbed mustard vinaigrette. I think I will have to try the herbed vinaigrette first! So versatile. I am a mustard freak and this post is my DREAM! Can’t wait to try them all!